Everybody loves a good summer holiday. Whether you’re venturing afar to outback Australia, or chilling on the beach in Tunisia, or taking a short weekend break to Cambridge, a moment of consideration should be given to the environment and society no matter where you go. Going on holiday shouldn’t be an excuse to abandon good, environmentally-friendly habits for a week. It may seem tough to make holidays sustainable, what with airplane exhaust fumes and holiday destinations readily becoming globalised. Here are our top ten tips for squeezing every inch of sustainability out of your summer abroad. Don’t let your vacation destroy this beautiful paradise. Understand the environmental you are visiting. Learn about the natural environment, culture and history to truly experience and understand the destination you are visiting. Talk to locals, visit historic attractions, try local cuisine and participate in local activities and events. Participate in an Aborigine tribal dance while travelling in Australia. While we don’t suggest you go crazy, buying local products and produce helps support the locals, who may depend on tourism for their income. So go ahead and buy a loaf of Turkish Ramadan bread to take home for your parents, a Greek vase, or take part in a Native American healing ritual. As long as you don’t spend over your limit, it can only do good! While it’s important to support locals by buying their produce, consider its origins before purchasing. Never buy products made from endangered wildlife and certainly do not bring it back home- in many countries, this is illegal! It’s hard to completely stop fuel use when vacationing, unless you’re walking or cycling to or through your destination. Instead, think of ways to cut down on fuel use. If you’re travelling within the UK, take a coach or train to your destination instead of driving. If you’re flying to your destination, book direct flights instead of changing. Walk or cycle as much as possible in your chosen destination. It may be more economically costly, but it will do a world of good for the environment! Remember, staying closer to home is the best way to reduce your carbon footprint. So if you want to be truly sustainable, consider a camping trip in the UK rather than a resort holiday in Greece. 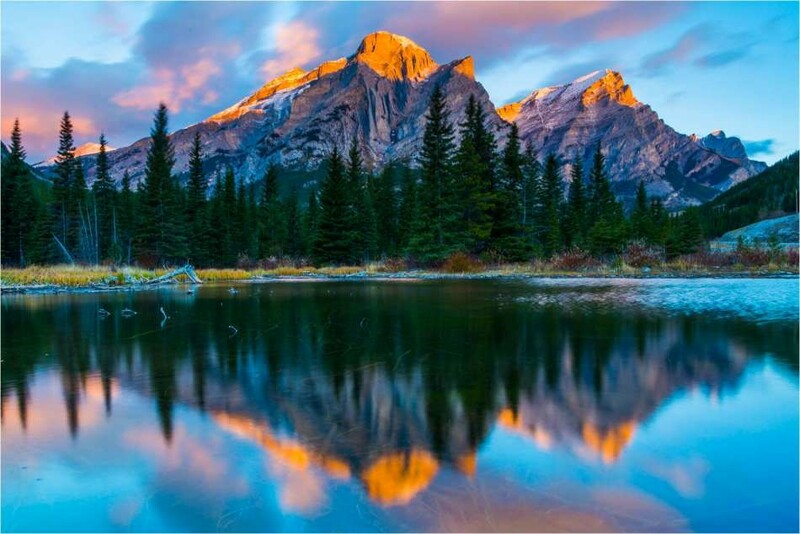 Inter-rail across the stunning Kananaskis Mountains in Canada, rather than drive. Don’t let your good habits turn bad. Continue to recycle while on holiday. Dispose of your waste properly at the designated facilities. Dispose with care to protect the wildlife, and to leave the destination a beautiful place for future generations to enjoy. Plan your holiday with sustainability in mind. Ensure you book your holiday with companies that engage in sustainability, perhaps through energy efficiency or recycling initiatives, or through actively helping to preserve communities and the environment. Similarly, make sure your hotel is green as well! Destinations such as Ayia Napa, Ibiza, Kavos and Magaluf are well known for their vibrant nightlife and extreme clubbing. While this is fun for tourists, this behaviour may have inadvertent effects on the local community. Families with young children will not want to hear screaming and shouting at 3 o’clock in the morning. Similarly, local residents will not appreciate discovering broken glass bottles on pavements. Consider the impacts of your actions on the local community before embarking on this type of holiday. Vacations that are truly sustainable do not negatively impact on the local community. Take the advantage of following the local dress code to explore the local culture. Dress appropriately by learning about local conventions. Remember that dressing modestly is an important aspect of many cultures. Learn the local language before or during your trip. Use the language you have learned to talk to locals and develop relationships with them. Make it one of your aims to not just leave the destination how you found it, but leave it better than you found it! Make the conscious decision to improve the destination by picking up trash, volunteering or donating money. Preserve the stunning beauty of the Greek islands for years to come. Did you know there is such a thing as sustainable tourism? Help prevent the destruction of natural features such as coral reefs by thinking sustainably while on holiday. Sustainable tourists aim to make only a positive impact on the environment, society and economy when visiting their chosen destination, using local transportation, accommodation, entertainment, food and shopping. Sustainable tourists should respect local cultures and environment, buying locally unfairly, protect water, energy and endangered wildlife, take responsibility for their actions, protect and enhance destinations. Everybody should be a sustainable tourists, no matter how close or far away from home they are travelling. Following the 10 above steps will not only help you become the best sustainable tourist possible, but help preserve our beloved tourist destinations for many years to come! Categories: Lifestyle | Tags: abroad, holiday, sgo, summer, sustainability, sustainable, tips, travel, travelling, vacation | Permalink.